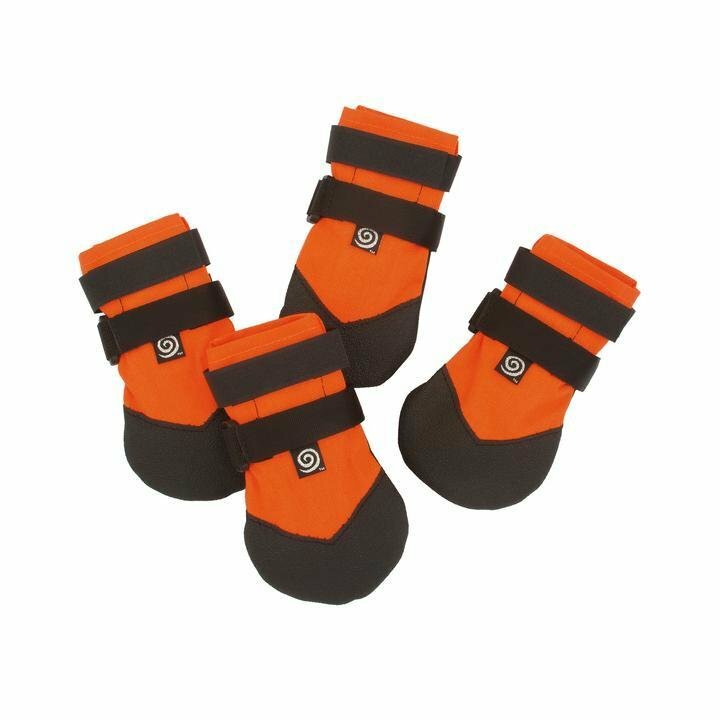 Designed for active hard charging dogs when extra sole protection is needed. Incorporating the same design as the Ultra Paws Durable boot, it has a recycled tire sole, about 50% thicker than the Durable sole, and suited for tougher conditions. This is the boot for hunters, urban settings on asphalt or concrete, snow, and protection from salt in the winter. Four sizes based on width of paw. $37.95 to $39.95 depending on size, for a set of four boots. Canadian Patent 2,486,628. Other patents pending. Side seams open wide - making it easy to put on the boot. The foam creates a secure grip - these boots stay on! To extend the life of your boots we recommend applying Shoe Goo to patch small holes in the sole that can appear with wear. Some hunters will pre-apply Shoe Goo when in extreme conditions. Loosely fasten Velcro closure, wash in cold water delicate cycle; hang to air dry.